Walt Disney had a large personal interest in animals and stories about them, but few animals were highlighted in his films as much as dogs. He had already produced a handful of films that put them front and center, including Lady and the Tramp, Old Yeller, The Shaggy Dog and One Hundred and One Dalmatians. For his next project, Walt was inspired by a book based on a touching true story, Greyfriars Bobby by Eleanor Atkinson. Walt hired Don Chaffey to direct his first of several Disney films (the most famous of which was Pete's Dragon). Since he used an all UK cast, he wasn't able to pull from his normal stable of stars but there are a few familiar faces. Donald Crisp plays James Brown after playing the mayor in Pollyanna. Laurence Naismith had a small role in Third Man on the Mountain and would later appear in The Three Lives of Thomasina (also directed by Don Chaffey). Duncan Macrae, Andrew Cruickshank and Alex Mackenzie had small roles in Kidnapped and Duncan and Alex also returned for Thomasina. While a lot of location shooting was done in Scottland, including the original graveyard the real Bobby slept in, the Edinburgh Village scenes were filmed on sets at Shepperton Studios in Surrey, England. The film opens with a narrative introduction set to footage of Scotland as the credits play. Bobby is an adorable Skye terrier that lives on a farm and worships one of the farm hands, Old Jock. When Jock is fired because the family can't afford him anymore, Bobby runs away after him to the town of Edinburgh. Old Jock soon dies of pneumonia and takes to sleeping on his grave in Greyfriars Kirkyard (cemetary). The caretaker removes Bobby from the kirkyard every night, but he finds his way back in. The little dog eventually captures the hearts of the caretaker, a restaurant owner named Mr. Trill and all of the neighborhood children. The law in Edinburgh is tough on stray dogs, and without a legal owner, Bobby risks being put down. The Lord Provost claims that because Mr. Trill feeds the dog, he should pay the license fee. Mr Trill refuses on the principle that the dog doesn't sleep in his home and therefore doesn't belong to him. At the last minute, the neighborhood arrive at the courthouse, having saved up enough money to pay for the license. The film ends with Bobby returning to Old Jock's grave to sleep as the neighborhood children are heard off camera saying "Goodnight Bobby." 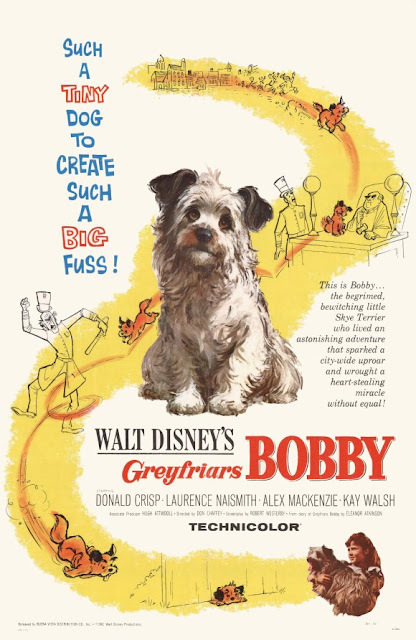 Greyfriars Bobby was released on September 28th, 1961. Critics were mostly favorable to it, citing its charm and beautiful imagery as it's strengths. The two criticisms they threw at it were that the plot takes too long to develop and that the accents are often hard to understand, a recurring criticism for every Disney film using accents (they said the same thing about Rob Roy and Darby O'Gil and the Little People). It was not a success at the box office and made its television debut in 1964. It received its first home video release in 1986. Greyfriars Bobby is a beautiful and touching film that stays with you, without ever getting too emotional. I fell in love with this film a few years ago when I first saw it. It's a shame that it hasn't grown in popularity over the years like other great Disney films that didn't do well originally because it certainly matches the quality of those films. The book on which the Disney film is based does delineate from the true story quite a bit. Bobby's real owner was a policeman who died of tuberculosis. When the law mandated that Bobby be put down without an owner, it was actually the Lord Provost who paid the fee. A statue of Bobby is in the real Greyfriars Kirkyard. The story inspired another film in 2006 by Picadilly Pictures called The Adventures of Greyfriars Bobby in the UK. Greyfriars Bobby is currently available on DVD. The film is presented in fullscreen, however it was filmed and originally presented in a widescreen aspect ratio of 1.75:1 meaning this is a pan & scan release. There are no bonus features. It is also available on iTunes, where it is correctly presented in widescreen and in HD. Very nice review of one of my favorite dog movies. As you wrote, it's a beautful, touching film that never turns sappy. Interestingly, Bobby's story also formed the basis for 1949's CHALLENGE TO LASSIE--which also starred Donald Crisp. I like Lassie, but GREYFRIARS BOBBY is a superior film.